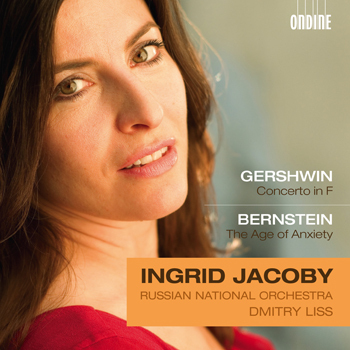 This CD features acclaimed pianist Ingrid Jacoby as soloist with masterpieces of George Gershwin and Leonard Bernstein, two of the most widely acclaimed American composers of the 20th century. Gershwin’s Concerto in F famously illustrates the bridge between the worlds of classical and jazz/popular music. Bernstein’s monumental Symphony No. 2, inspired by W.H. Auden’s dramatic poem “The Age of Anxiety” (1947), is regarded as one of his finest classical works. Praised by The New York Times for her "clear articulation… unequivocal phrasing… (and) expressivity", Ingrid Jacoby has established herself as one of the most poetic and admired pianists of her generation. Conductor Dmitry Liss leads the Russian National Orchestra; since its foundation by Mikhail Pletnev in 1990, it has quickly reached a position at the top of Russian orchestras, as well as among the top ten of international orchestras, as listed by Gramophone.